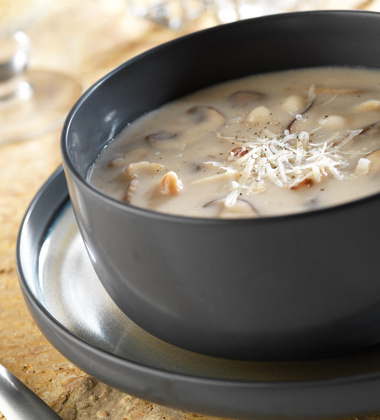 Flavors from wild mushrooms, beans, white wine and Parmesan cheese combine with Campbells® Condensed Cream of Mushroom Soup to make a creamy chowder. 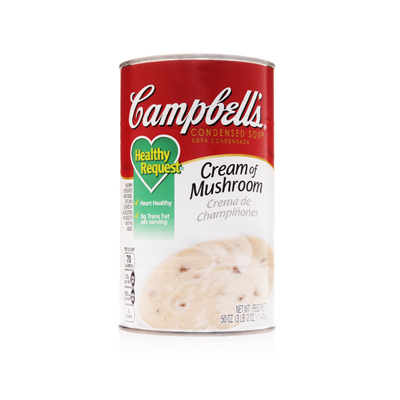 Add to any menu for variety in soup and appetizer options. wild mushrooms, sliced	 20 oz. garlic, peeled, roasted, mashed	 2 tbsp. 1. In pot heat oil over medium-high heat; add mushrooms and sauté mixture, stirring often, 10 minutes, until mushrooms are almost dry. 3. Stir in wine and bring to a boil and reduce until almost dry. 4. Add soup and water and bring to a boil; reduce heat and simmer 10 minutes. black pepper, cracked	 1 1/2 tsp. 5. Stir in beans and simmer 5 minutes. Add pepper and return to a simmer. Heat until internal temperature is 165º F. or higher for 15 seconds. CCP: Hold at 140º F. or higher. 6. Garnish each serving with 1 tsp. of grated Parmesan cheese.